Darwinian Depression | WOTM Watchdog! Todd, however, is interested in running a radio show, not conducting a scientific study. And so rather than worry about it, he just asks his tour guide for his opinion. It isnâ€™t terribly surprising that he believed that the European teens (or at least those in the UK) were on average more depressed than their cousins across the pond. Less surprising is the reason Todd and his Scottish friend give for those depressed kids. 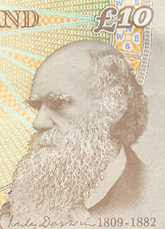 Itâ€™s Charles Darwin and his evil theory of evolution. What other answer could there be? The UK is more secular than the US. A larger percentage of their population accepts evolution. And, perhaps worst of allâ€¦Darwin is on their money! So of course Todd puts two and two together. By believing in evolution, these poor teenagers think they came from nothing and are going nowhere. If they had Jesus and The Bible then they just might see that thereâ€™s something to live for. First of all, I am not a scientist. But I am the youngest Watchdog here. It wasnâ€™t all that long ago that I was a teenager myself. And a depressed one at that. While I canâ€™t speak for even a small part of the population, I can say that not once did I stop and think about evolution being true and have that add to my bad vibes. Second of all, Todd is forgetting a very simple thingâ€¦which isnâ€™t that unusual for Todd. Letâ€™s suppose that heâ€™s one hundred percent correct. Not only are teens more depressed in Europe, but the reason for that depression is that theyâ€™ve been taught that evolution is correct and they canâ€™t party with Jesus after they die. Even if all that is true, it doesnâ€™t disprove evolution or prove Christianity. All it would mean is that Christianity is comforting to people. Unfortunately for Todd, that is no kind of proof. "There are all sorts of things that would be comforting. I expect an injection of morphine would be comforting---it might be more comforting, for all I know. But to say that something is comforting is not to say that it's true." â€“ Richard Dawkins. The usual listeners of WOTM Radio may not figure that out for themselves. Because Jesus makes them feel good they assume he must be real. But with any luck, some of them will visit us and be put straight. Even if they do end up going away depressed.